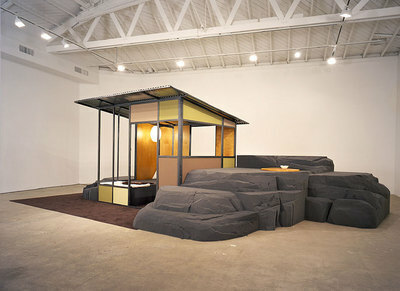 In our short list of artists we like, we would like to add Andrea Zittel and her ever-expanding A-Z project. The project explores many basic aspects of domestic life: storage, lounging, sleeping, more storage, food prep, clothing, and shelter. While some of the projects edge toward the cutely didactic (I think we were the only ones in NYC who didn't like 1996's Escape Vehicles show), projects like Homestead Unit With Raugh Furniture (pictured) cross boundaries between architecture and furniture. The distinctions are expertly blurred using surrealist techniques, without letting the project cross over into sculpture territory. A must for architects and interior designers looking to push the boundaries.